A project by Muslimas Oasis, Blue Hijab Day is an annual campaign to educate people about autism. I have a personal attachment to this cause so this year I'll be taking part inshaallah. Autism Info Autism is a complex developmental disability (or difference as many parents and advocates like to call it) that typically appears during the first two years of life. Autism is the result of a neurological disorder that affects the functioning of the brain, impacting development in the areas of social interaction and communication skills. Autism is not a psychological disorder or mental illness. Read more on Blue Hijab Day's info page. 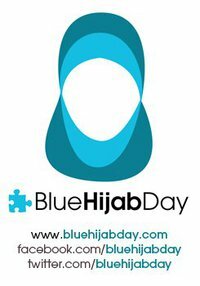 Tell people about Autism & the Blue Hijab Day effort. If you’re a media outlet, talk about Autism and the Blue Hijab Day effort. Organize a Blue Hijab Day event, walk, meeting, fundraiser for April. 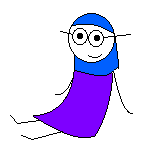 Participate in other Autism efforts while wearing your Blue Hijab Day tag. If you know someone with Autism or with a child on the spectrum, find out if there’s any way you can help them. For them, Autism is year round. Wear a Blue Hijab (Scarf) on April 2nd (UN World Autism Awareness Day). Print out the fliers from our website and put them up or hand them out. Print the tag and pin it to your hijab or clothing on Blue Hijab Day to let others know why you’re wearing Blue. If you don’t wear hijab and want to participate, you can wear a blue scarf or hat. Men can wear a kufi, hat, scarf or tie. And if you don’t have any of these items and can’t get one, just wear anything blue. Don’t forget to tell people - about Blue Hijab Day and about Autism - and invite others to do the same! We chose blue to co-ordinate with other efforts to wear blue for Autism Awareness and Autism Speaks’ ‘Light it up blue’ campaign, we want to be a mainstream effort with a Muslim face. Besides, we thought a puzzle hijab might be difficult to find.